If you’re worried about accidentally booking a book festival ticket instead of an hour of stand up, don’t be. 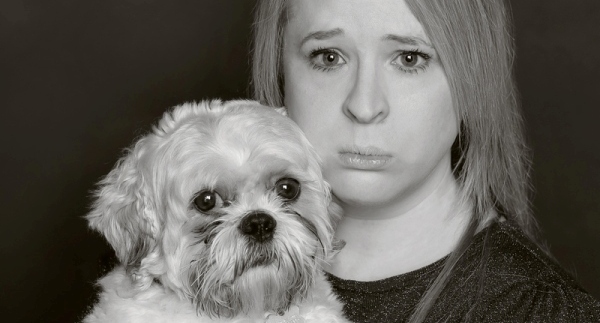 Hayley Ellis’s show title might reference the best selling novel by Lionel Shriver, but her Kevin is actually a Lhasa Apso dog and the only reason we need to talk about him is because her show would be a bit dull if she didn’t. Kevin is the main source of entertaining anecdotes, affection, stability and – to an extent- love in Ellis’ chaotic life. The likeable, warm Mancunian has certainly had her share of bad luck. Her dad left when she was young, her mum is rarely pleased to see her and her sister is so keen to avoid the limelight that her name isn’t even mentioned in the show. Kevin might eat his own poo, but he’s there for her in a way that her Liam Gallagher-esque fiancé isn’t. Ellis exploits her own haplessness and bad fortune to great comic effect, as well as talking so extensively about dogs you feel a bit like you’re sitting through a live action reenactment of the film Best In Show. We’re asked if we have dogs, what kind of dogs we have, why we chose that kind of dog and whether our dog has ever ruined our relationship. It could all get a bit much, but fortunately Ellis is so charming, funny and quick that all the dog chat- and the associated questionnaire- does work well. She also makes good use of PowerPoint, which is always a bit of a treat. When you see a screen in a Fringe show it’s a bit like the moment when – as a kid- your teacher would wheel in a gigantic television. “Great!” you think “this is going to be fun.” Sometimes it is, sometimes it isn’t, but in this case the video sections worked incredibly well and added a lot to her tales of unfortunate family events, breakups and, of course, Kevin. We got to see the furry star of the show doing tricks, failing to do tricks and wearing a teeny tiny coat. If you like dogs – or just footage of people failing to get a dog to jump over a very small fence – then you’re in for a treat. Another (uncredited) star of the show is Ellis’s grandfather who appears in both anecdotes and footage a couple of times. He’s a great, funny and incredibly blunt man. He’s also a skilled dancer who should definitely get his very own Fringe show next year. We Need To Talk About Kevin is a fine-spun tale of woe, counselling, family and the redemptive power of love- particularly if it’s delivered by a Lhasa Apso dog with the expression of Nicholas Cage. Since the events detailed in the show, Ellis seems to have turned a corner and her life seems to have got much, much better. This is a shame, as she’s at her most funny when she’s talking about terrible life events. Taking a purely unselfish approach, it would be great if this upward spiral continues as she really does deserve to be happy. However, for the sake of future audiences let’s hope that something rubbish happens. If it does, at least she’ll still have Kevin.